Plug, read, done. Sensitest makes it simple. Provides tests for all types of SpO2 probes in the biomedical and clinical environment. Uses a single 9V Alkaline Battery. 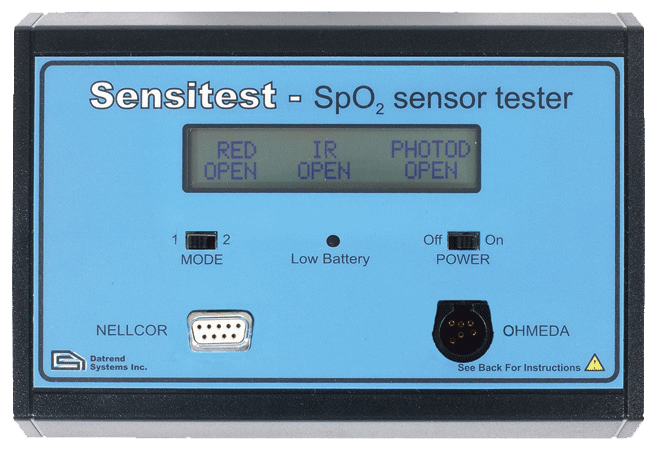 Sensitest provides tests for all types of SpO2 probes in the biomedical and clinical environment. This compact devices draws power for two modes of testing from a single 9V Alkaline Battery. Continuity checks for the red LED, the infrared LED, and the photodiode circuits. Mode 1 Operation:Continuity checks for the red LED, the infrared LED, and the photodiode circuits. Mode 2 Operation:Measures and displays the photodiode’s response to red and infrared LEDs. Nellcor and Ohmeda connectors Standard. Datex, Hewlett Packard, Novamatrix, Spacelabs, Invivo, Datascope, Criticare, Critikon, Sensormetics, PhysioControl, Simed and Nihon Koden. Fast and easy for anyone to use to check cable sensors before or after repair, Sensitest avoids use of adapter cables in most applications.